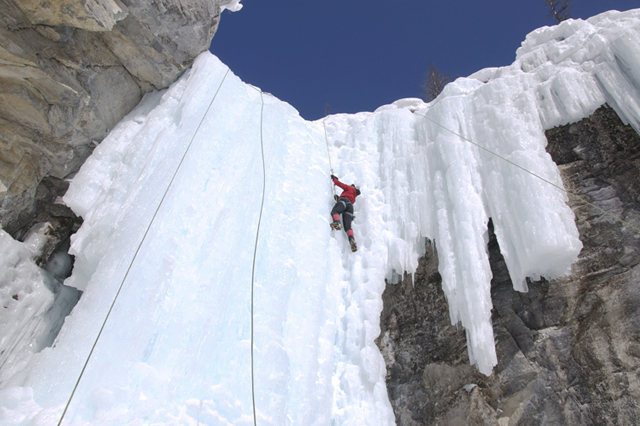 Now that you are hooked on ice climbing, you would like to go out on your own. Developing intermediate level climbing skills will accelerate your transition to advanced ice climbing. Continue your learning progression by joining our Top Rope Management ice climbing course in Canada where you will learn the skills required to set up top rope ice climbs. 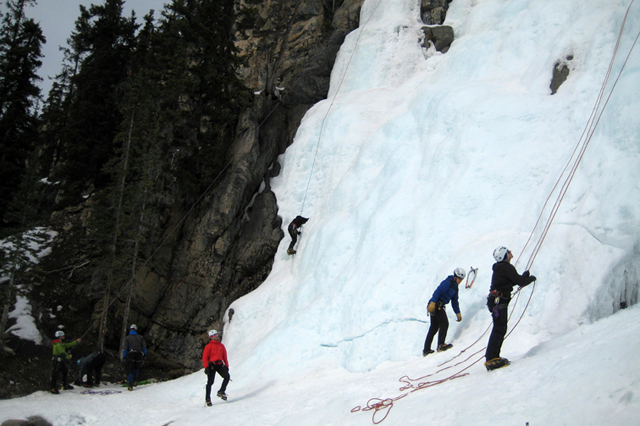 Using the climbing areas in the Banff, Canmore and Kananaskis areas we will cover anchor positioning, construction and cleaning, placing ice screws as directionals, belayer positioning and anchoring, rappelling and general hazard management for single pitch ice climbing areas. Of course, we will continue to build on and improve your skills developed during our beginner ice climbing course with personalized coaching. 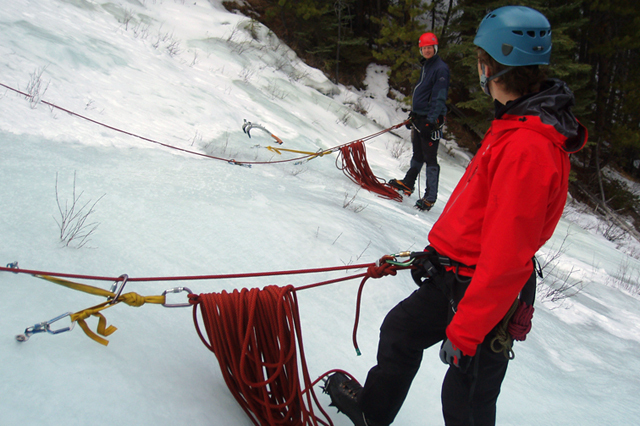 This is an essential outdoor top rope ice climbing course in Canada. We have decades of experience introducing people to the sport of ice climbing in addition to helping them progress to intermediate and advanced climbers. Our office in Canmore, Alberta is fully equipped with all the ice climbing gear you need to get started. Stay for an extra day after the Top Rope Management course and put your new skills into practice on a classic Canadian Rockies multi-pitch ice climb. The instructor to student ratio is 1:2, we divide into compatible teams, choose a suitable ‘multi-pitch’ route (several rope lengths in height) and spend the day climbing it. 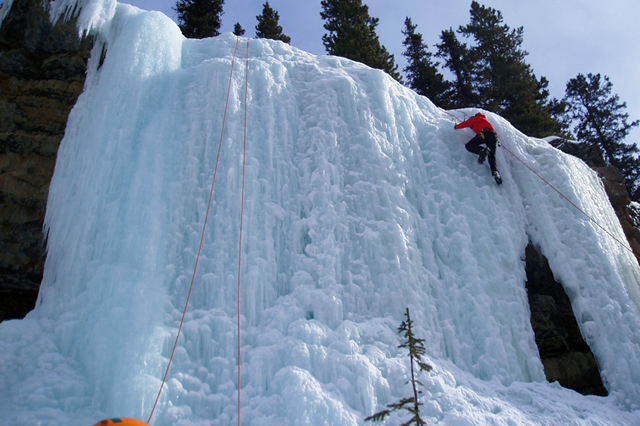 We have a seemingly endless list of multi-pitch ice climbs in the Banff, Canmore, Kananaskis and Lake Louise areas. $345 plus GST. Every 3rd day following the Top Rope Management course. Available to Top Rope Management course participants only. The course begins at the Yamnuska office in Canmore at 7:30 am on the first day. The Yamnuska office is located at 200, 50 Lincoln Park, Canmore, Alberta. See this map for location. $345 plus GST. Available as a 3rd day of multi-pitch climbing following the ‘Ice Climbing Level 2 – Top Rope Management’ program days. Available to Top Rope Management participants only. The Top Rope Management course is suitable for ice climbers, rock climbers or mountaineers who are comfortable with top rope belaying and have used crampons before. Ice climbing can be a strenuous activity but our instruction will emphasize development of technique to reduce the need for brute strength. The ice climbing routes will be tailored towards your ability and strength as much as possible and the venues will be chosen to provide the best learning opportunities. A high level of fitness will contribute to enjoyment and achievement as will being up to date with your gear, basic knots and top rope belaying.